A group of evergreen medium to large shrubs, Iochroma grow well in hot dry conditions. They flower over many months from summer through well into autumn, and attract nectar loving birds to the garden. Over recent years some interesting hybridisation has been carried out, with new flower colours including a white flowering type offered by selected wholesalers. Large foliage looks good year round, and as long as they are planted in a frost free position they stay looking good all year. These are a tall growing plant that landscapers can use at the rear of the border as a background plant. Iochroma will sucker, however they are easy to remove. Iochroma are originally from South America. Iochroma cyaneum has masses tubular shaped purple flowers however with hybridisation wholesale growers now offer a wide number of flower colours of this easy to grow bird attracting plant. 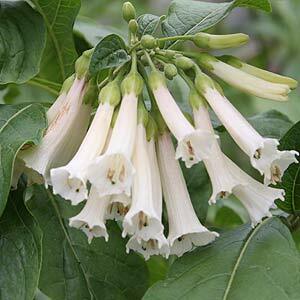 The ‘classic’ Iochroma species are listed below, however new white flowering cultivars and some with deep red flowers are also available. Lots of cultivar names are around including ‘Royal Queen’, in Australia look for Iochroma cyanea and its purple flowering cultivars, widely offered by wholesale growers.. I. cyaneum – This is a fast growing shrub to small tree. Reachs 3 – 4m in height classic deep purple flowers from summer through to autumn. I. warcewwiczii – Attractive pale blue flowers in clusters, long flowering and large flowers to 10cm. I. coccinea – Orange/Red to Scarlet flowers , smaller flowers to around 5cm and requires a warm sheltered position.